Practicing and teaching yoga outside is a big highlight of my summer. I love to take my own practice to the park as soon as it gets warm, either by myself or with friends. I love how soft and forgiving the grass is when playing around with new things like arm balances or handstands. I love feeling the breeze on my skin and looking up at the tree tops while I’m in a pose. To me yoga is about relationship and connection, and in practicing yoga outside the feeling of connection to the environment and the world is more palpable and sweetly profound. I’ve been teaching yoga outside for the past few years (partnering with the City of Kitchener for Wednesday classes, and sharing Queen Street Yoga love on Sundays) and I love sharing the practice of awareness, breath and movement with new people. There is something really special about public parks as a site for yoga as well. Parks tend to be welcoming and accessible places. There are far fewer barriers to accessibility in the park: there are no stairs, the classes are free (thanks to the City of Kitchener and new teachers volunteering their time) and all levels and ages are welcome. I love seeing people stroll up on foot or ride in on their bike to class coming from work, bringing little ones in their strollers, coming solo or bringing a group of friends. There’s a kind of democracy and neutrality to a public park: it’s a place that we’ve collectively chosen to share, and so having a class in the park helps yoga to be more inviting, and hopefully less intimidating to newcomers. One last bonus to teaching outside is that I can use language that would otherwise be flowery or cheesy. Yoga teachers are known for their sometimes obnoxious use of sayings like “reach up towards the sky” or “flow down towards the earth” but in the park I can say that sort of stuff and it’s true! In fact I often catch myself in the park saying “Bring your hands to the floor” or “Reach for the ceiling”. People giggle at the irony, and we’re all reminded of how lucky we are to get to do yoga outside and connect with the natural environment together. We hope you have a chance to join us sometime this summer, to play together on the grass in the public, outdoor space of Victoria Park! Wednesday Yoga in the Park– 12-12:50pm, June-August. Meet near the Clocktower at the Joseph Street Entrance to Yoga in the Park. Taught by Leena and other QSY teachers. 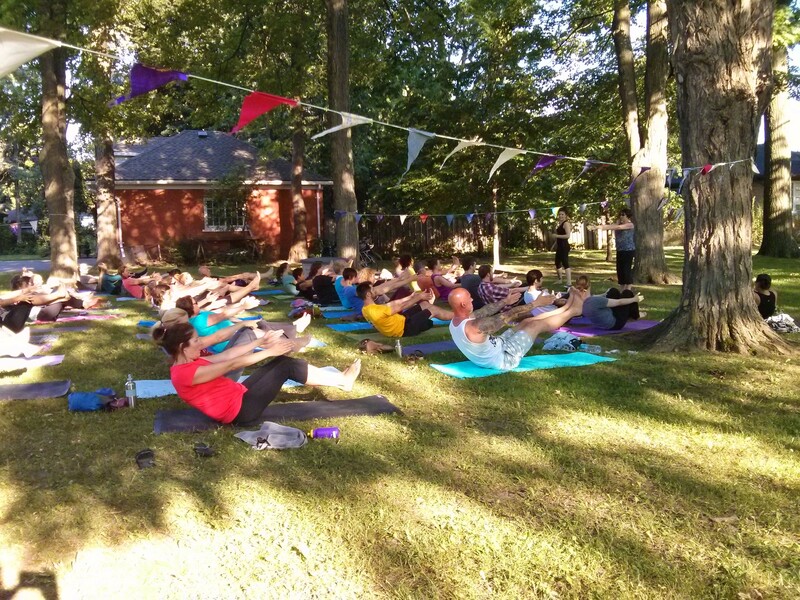 Sunday Yoga in the Park– 6-7pm, July-August only. Meet at the end of Schneider Ave, 79 Schneider St in the back of Victoria Park. Taught by enthusiastic new teachers from our Teacher Training Program.